They have a cracking winelist with a great selection of sherries by the glass (unfortunately not listed on the web) – including some excellent finos (the W&H Vintage 2006, a Fernando de Castilla en Rama from 2014, and a Tradicion), a Maestro Sierra 15 year old oloroso, some top end Tradicion VORS and the Toro Albala Vintage 1983 (in fact I gather they have some of the Toro Albala Convent hidden away). If I was going to grumble it would be that the list of sherries is a little bit hidden (under the title “by the glass”) and maybe a bit short on mid-range, pairable wines. Having said that, what is there is of the highest quality (in keeping with the rest of the winelist, which is superb). More importantly, perhaps, some quite superb food to accompany the sherry. In addition to the menu there was a long list of off menu seasonal dishes – and no nonsense either, just quality old school cooking. 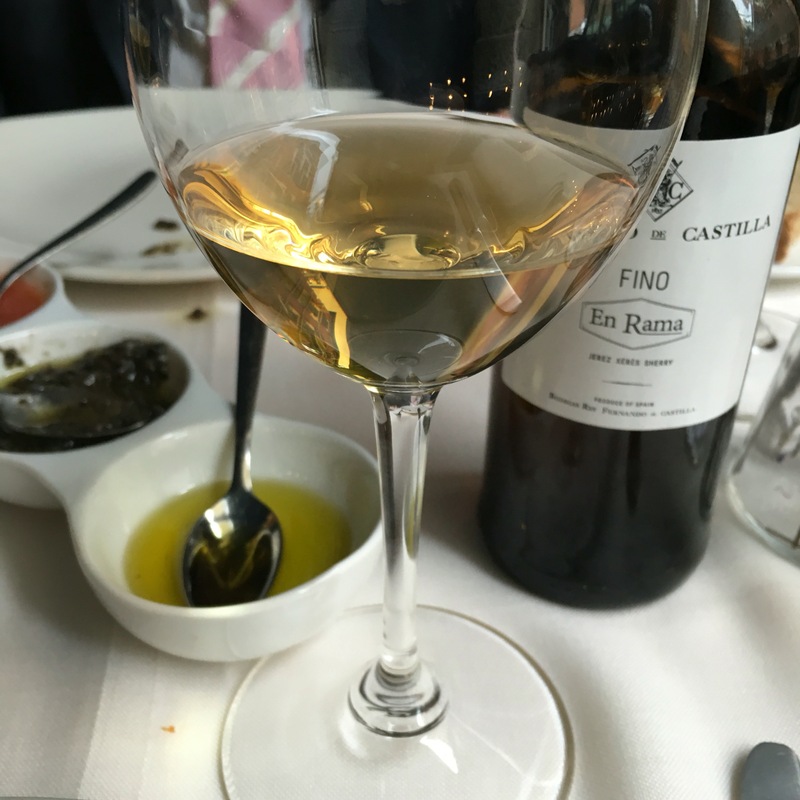 We had a glass of the Vintage 2006 with some spectacular guisantes lagrima (la caviar de la huerta – see above) and some baby beans with butifarra negra and then a spicey tartare that was brilliant with the Fernando de Castilla Fino en Rama 2014. Really high class stuff .